Many oversea buyers intend to send their inquiries to a bunch of Chinese plastic injection mold makers before they placed order to one of them, choices sometimes just simply made base on price. If you are lucky enough, you could probably get a qualified molded product at the cheapest price. But what about the next time? Your business success should not be hanging on odds. Whenever you get a quotation from a China mould supplier, you better have your own sense to estimate if it's competitive or reasonable or it's over-charged. It's very much necessary to understand the actual mold price in China. Cost of a plastic molded part includes raw material, injection molding, labor cost, packing, transportation, management, and profit. Let ‘s get into each items one by one. Raw materials cost = unit weight + runner weight /cavities + waste ratio, total weight x raw material price. 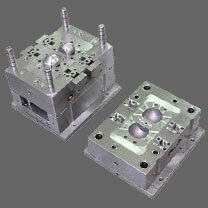 Waste ratio takes 1-3% usually while the injection mold is cold runner design. It's much lower if your mold use hot runner. Injection molding machine cost = machine molding price/24h/3600s * molding cycle time. Different machine have different price base on capacity. Let's see a few examples, 50Ton, 0.3 RMB/minute, 80 Ton, 0.5RMB / minute. Production in China usually is not automatically and need to have worker to do oil cleaning, pick-up, packing etc. Currently each worker (not technician) costs 30 RMB/hour. This cost would depend on the packing way you agreed with your plastic mold manufacturer. Depends on what kind of delivery term you agreed with supplier. Basically this is the cost of your plastic parts, supplier will add a certain amount profit and management cost on it, you can decide now on your own if the price they offered is worth it or not.